Wow, I have not had one of these since I was in Paris and your post brought me right back. I wish I could take a bite. I'm glad you have found a fondness for swiss in this recipe. I'm sure you could substitute for a more palatable cheese if you wanted. one of MY favorites. wonderful! So sweet of you to make this for your dairy-loving mom! Even your purse camera photos look good! This was once of my favorites. This looks so amazing and gooey!! Delish!! I need to try this for my family on a Saturday afternoon. Bravo! This was just a wonderful sandwich. Your photos are great and I'll bet that bread was perfect. This was a keeper for sure. I love white chocolate and rasberry together! Thanks for this idea. Mmm, that sandwich looks divine! I'm so glad your mom enjoyed it. It must be good if it can make you forget that you don't like Swiss :) Mmm, you're giving me a craving for a Croque Monsieur. By the way, I've never heard of Roman Meal bread; what's it like? I ♥ reading your blog! And your sandwiches are terrific looking, even with the "purse camera!" Keep on cookin'! Anne, all of my pictures are purse camera pictures - so I need to issue a blanket apology for all of my photos! 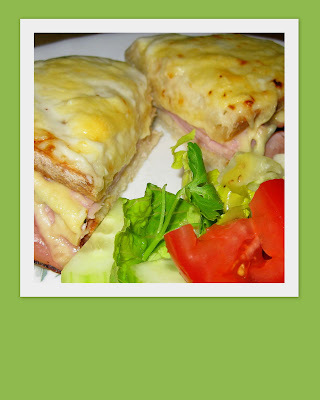 Your croque monsier looks incredible! I LOVED this sandwich and am really craving another one right about now. Aren't you cute making this for your Mum? And don't worry about the sandwich - you need the calcium right now for the passeneger! I do love my dairy, all except plain milk that is! This sandwich was as good as it looks. For the record, I'm waiting for someone to design a DSLR the size of my purse camera and you'll be coveting mine!